Parisian finds. Photo by Berit Baugher. A long weekend in Paris means a stuffed suitcase to lug back home. PARIS – Paris will forever be a reliable place to spend all your money shopping. (On a recent visit, I went a little bit crazy with finds for my apartment and gifts for family and friends.) Look out for items that are truly special — made locally and thoughtfully, and with France on the mind. What: The mystique of French pharmacies is well-documented across the internet. The drugstore offerings in Paris are just so much better than anything you will find in the U.S.; they are also significantly cheaper. Beyond the mango-scented shampoo, fancy cream, face wash, and skin oil, I like to stock up on Caudalie's Lip Conditioner. What: On my way to Jardin du Luxembourg, I came across the new Astier de Villatte store in Saint Germain. Their white-glazed earthenware pottery is entirely handmade in a Parisian workshop. It is there that I picked up a notebook silk-screened by the last existing master printer in Paris, and a small bowl for my growing pottery collection. What: I came across the Parisian-designed, Indian-made textile brand a few years ago on Instagram and was so in love with the beautiful pieces that I reached out to founder Usha Bora to have her write a story for Fathom. On this trip, I finally had the opportunity to check out her shop in the 10th and picked up a set of navy blue hand-blocked cotton napkins. What: Kerzon scented sachets are my favorite souvenirs. 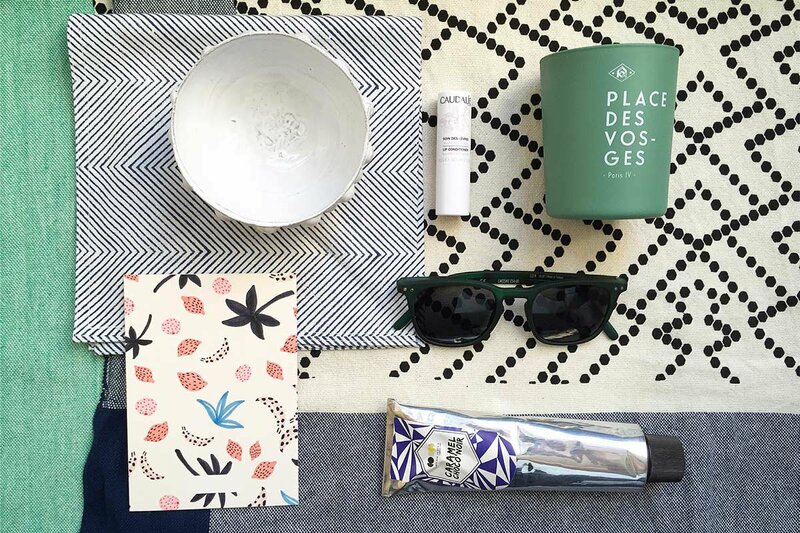 I visited their pop-up at Papier Tigre and went for a scented candle inspired by Place des Vosges. What: Culty French brand Sézane has a beautiful shop in the 2nd stocked with "French girl" dresses, shoes, bags, and an assortment of goods from local designers. Parisian-based Mapoésie is designed by Elsa Poux, a graduate from the National School of Decorative Arts who creates patterned beach towels, scarves, and paper goods. What: I have mixed feelings about Collette, the world's original concept shop (the crowds make it unenjoyable). But I faced the throngs and was able to muscle my way to a pair of green shades from a French brand called See Concept. Founded by three childhood friends from Lyon, the glasses are well made and surprisingly affordable. What: A total sucker for stationery, I can never resist buying a few cards to keep on hand for birthdays and holidays. The French-made stationery line is sold at Artazart, an independent bookstore and gallery with a stellar indie travel guide and art book selection. What: Fou de Pâtisserie boutique is another favorite stop. The pastry concept shop gathers the best pastries from the best local chefs and sells them under one roof in the 2nd. In addition to sampling a few of their treats, I picked up a squeeze tube of dark chocolate caramel to gift a friend with a major sweet tooth.